Anesthesia Research Harbor-UCLA Medical Center and Los Angeles Biomedical Research Institute (LA BioMed) at Harbor-UCLA Medical Center are among the country’s premier nonprofit research and training institutions. As part of this rich tradition, the areas of research interest in the department of Anesthesiology encompass both basic science and clinical anesthesia research. Expanding and enhancing the research mission in the department is one of our top priorities in Anesthesia at Harbor-UCLA Medical Center. • Exploration of mechanisms for peripheral neuropathic pain in animals. Dr. Jichang Li and Dr. Roberto Lopez are both involved in studying the basic mechanisms of chronic pelvic pain and chronic peripheral neuropathic pain in animal models. Dr. Li focuses primarily on mechanisms of chronic pelvic pain, particularly as related to inflammatory chronic pelvic pain syndromes. Dr. Lopez’s work focuses on the mechanisms of peripheral neuropathic pain in animals. Research in our basic science labs has focused on the molecular modulation of primary sensory neurons in the dorsal root ganglion by experimental induced chronic pain in rat models. During the last few years we have turned our attention to characterize the analgesic activities of different class of pain reducing medications on the sensation of neuropathic pain in rat models. The most common clinical manifestation of endometriosis is chronic pelvic pain. It affects up to 10-15% of women of productive age worldwide. The exact underlying causes of chronic pelvic pain associated with endometriosis are unclear. Studies implicated that neuronal invasion of endometriotic implants that subsequently develop sensory nerve supplies may play a critical role in pain production. Some evidence showed that there is a close histological relationship between sensory nerve fiber innervation and endometriotic lesions, which might cause chronic pelvic pain. Despite recent investigation in human and animals, the pathophysiology chronic pelvic pain associated with endometriosis is still poorly understood. We use experimental induced endometriosis animal model to investigate the modulation of activities of DRG neurons innervating endometriotic lesions to illuminate the mechanisms by which endometriosis might alternate pain perception. Peripheral neuropathic pain is frequently observed in patients with cancer, AIDS, long-standing diabetes, lumber disc syndrome, herpes infection, spinal cord injuries, etc. The pharmacotherapy for neuropathic pain has had a limited success with little or no response to commonly used pain reducing medications, such as opiates. The study of neuropathic pain in human is complex because most of the stimuli required to induce neuropathic pain produce irreversible damage, therefore, the neuropathic pain animal models are frequently used to broaden the knowledge of the mechanisms involved in neuropathic pain. We use spared nerve injury neuropathic pain animal model to identify the characterization of different class of pain reducing medication on pain sensation and investigate the modulation of activities of DRG neurons by peripheral neuropathic pain. Members of our faculty have maintained their important contributions to medical/scientific literature and have continued to play active roles in professional and research societies. Our clinical research faculty members examine acute and chronic pain, noninvasive monitoring of cardiovascular function, echocardiography, diminution of complications of ultrasound guided peripheral nerve block and many other topics. One area of focus in clinical research is to examine the incidence of any complications of ultrasound guided regional peripheral nerve block. 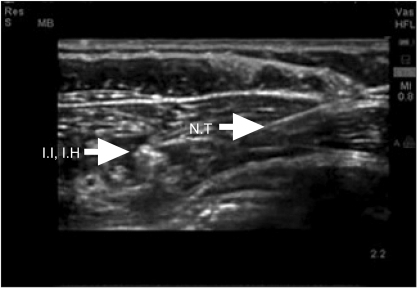 Using ultrasound guided regional peripheral nerve blockade, we are currently monitoring any potential complications of different regional peripheral nerve block techniques. In collaboration with the urology team, we have been studying the efficacy and safety of intranasal Fentanyl Pectin Spray as an analgesic in adult males undergoing outpatient cystoscopic procedures. We are currently studying the analgesic effect of intranasal fentanyl pectin spray 100mcg and 200 mcg as well as its safety for using in outpatient procedures. Other faculty members have looked at anesthesia management for patients undergoing endovascular stent graft of ascending aorta for type A dissection and /or aneurysm, etc.